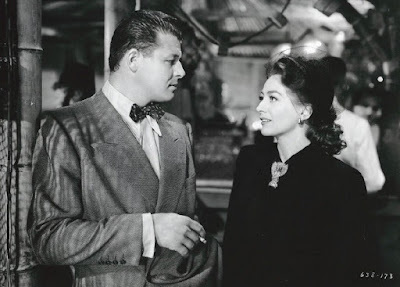 Today, I'm writing about my cinematic soft spot for the character of Wally Fay in the classic film noir Mildred Pierce (1945). 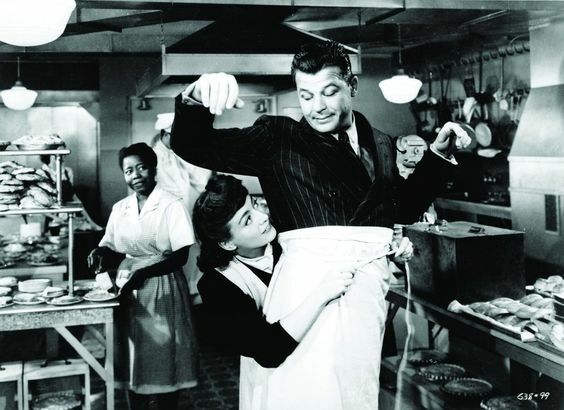 In the production still above, Wally, played by Jack Carson, straps on an apron to help Mildred (Joan Crawford) and Lottie (Butterfly McQueen) in the kitchen. This article is part of the Reel Infatuation Blogathon hosted by Font and Frock and Silver Screenings. There are many reasons I love Mildred Pierce (1945) including Joan Crawford's iconic performance, the German expressionist cinematography, and Eve Arden's withering wit. 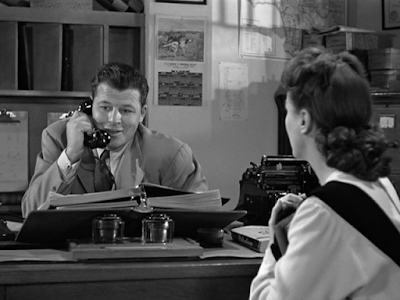 However, I confess that I return again and again to this classic film noir because of my cinematic soft spot for Wally Fay, Mildred's friend/business manager/rejected love interest played with wisecracking affability by Jack Carson. Wally certainly has his flaws such as a tendency towards braggadocio, a do-anything-for-a-buck mentality, and an inability to keep his hands to himself (at least around Mildred), but, looked at in a more forgiving light, he is actually the only remotely likable male character in a film where most of the men are, as Arden bluntly puts it, "stinkers." Today, I'll outline five reasons for my Wally crush. 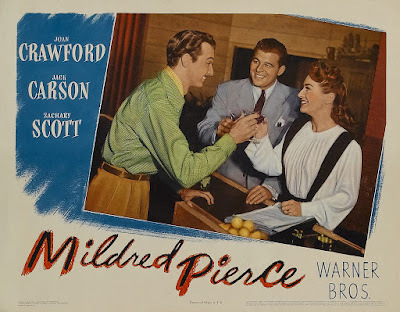 Just in case you haven't seen the film or you need a little more background, here's my film noir files article on Mildred Pierce. Casting is everything in old Hollywood films, and while Wally's slick style could have come off as repulsive in the hands of another actor, Carson's naturally amiable personality makes Wally the most endearing male character in the film. 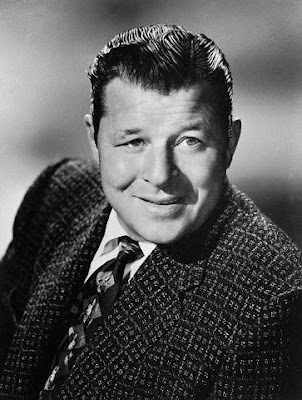 Carson has much in common with fellow Warner Bros. contract player Alan Hale (The Adventures of Robin Hood; Stella Dallas; It Happened One Night) in that they both used their bulky physiques and hail-fellow-well-met personalities to endear themselves to generations of moviegoers. . . .or Bert Pierce (Bruce Bennett) for that matter. While Mildred repeatedly turns down the marriage proposals of Wally, who, it should be emphasized, is the only male character in the film who actually has a JOB, she chases after permanently unemployed former rich boy Monte Beragon (Zachary Scott). 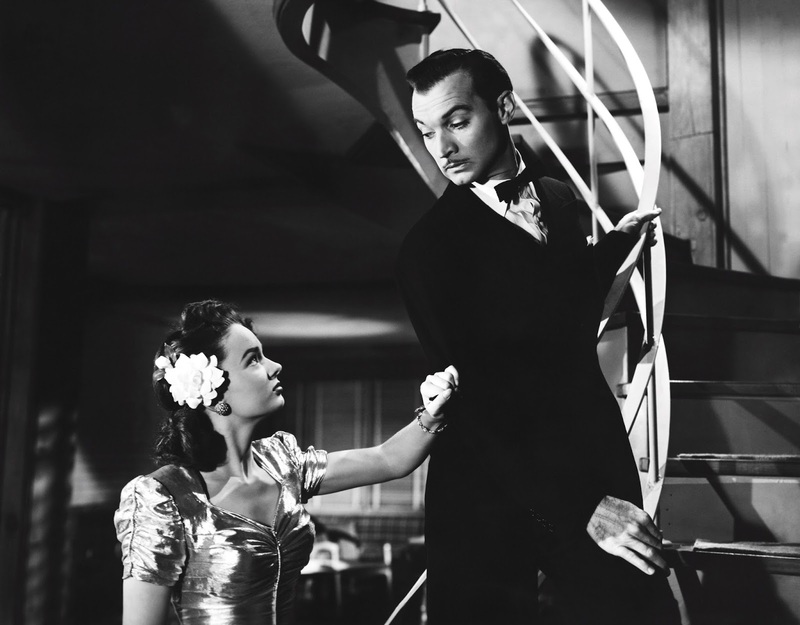 Monte spends his time clothes shopping with Mildred's money and carrying on an affair with her underage daughter, Veda (Ann Blyth, pictured above with Scott), while Mildred slaves away making chicken and waffles for the masses. In fact, when Monte sees Mildred going over her accounts he says, "I wish I could get that interested in work" (despite what he tells Mildred, I firmly believe that in Spanish Monte Beragon means "waste of space"). Her first husband, Bert, isn't really any better. When he loses his job, he prefers laying on the couch or playing "gin rummy" with neighbor Mrs. Biederhof (Lee Patrick) to actually looking for gainful employment. 3. He's so smart, it's a disease. Wally's oft-repeated catchphrase is meant to be humorous, but, in a way, it's true. Wally has a talent for turning any business deal to his advantage, even when it hurts Mildred. I've always thought Carson was handsome in an All-American sort of way (although he was proudly Canadian). He looks especially stylish in Mildred Pierce in his tailored suits, polka-dot bow ties, and straw boaters. It's heartening for all of us ladies over 40 to see a man who is actually interested in women his own age. Wally ignores the come-hither glances of the teenage Veda -- he's one of the few characters who realizes the truth about Veda early on -- and instead pursues Mildred and, occasionally, Arden's character. 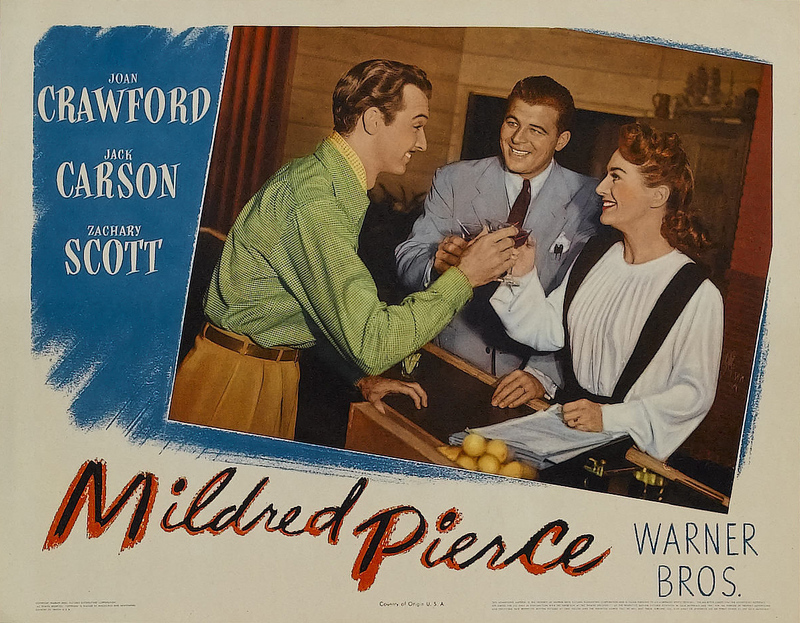 Mildred Pierce is available on DVD, Blu-ray, and video on demand. I agree. It's hard not to like Wally. Hey, the guy takes "no" for an answer! He gives Veda a job. He warns Mildred about Monte. Wally probably even understands about Mildred's attempt to frame him. She knew it wouldn't stick. He knew why she did it. I've always wondered what happened to the characters after Mildred Pierce ended. Did Veda manage to get off? Did Wally forgive Mildred for framing him? What was Monte Beragon's funeral like? etc. You made a good point about Wally being interested in women his own age. I'd never thought about it before, but he really couldn't care less about Veda. 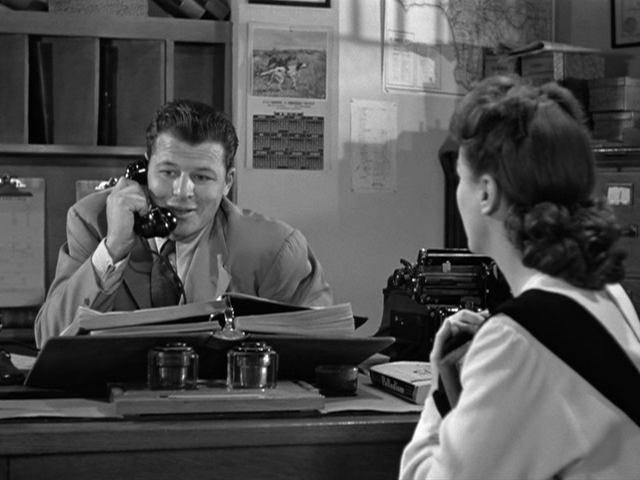 AND he's played by one of my faves, Jack Carson, which automatically makes him a shoe-in for Crush of the Year. I don't think anyone else could bring so much charm to Wally's character. In less experienced hands, he would just come across as opportunistic in an annoying way. Carson knows how to be opportunistic in an appealing way. I forgot about poor Moroni Olsen who has to spend two hours listening to Mildred's life story. Love this! I fell head over heels for Carson when he played with Dennis Morgan in "It's a Great Feeling" and as Myrna Loy's husband in "Roughly Speaking". He was a handsome devil and had such a winning personality. ...and I love when he knocks on wood when he tells Mildred he has no kids. Okay Wally, you hound dog! I can see why you're crushing on Wally. He gives zero f**ks!